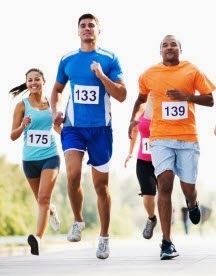 Running a half marathon tests your mental strength as much as it does your physical fitness. Each part of the half marathon has different mental battles. Here are some tips on how to win the challenges throughout the half marathon and run a successful race. Start out slow. When you start your half marathon, you'll feel strong and confident, but you have to tell yourself to hold back. Running your first half slower than the second half (called a negative split) is the key to running a smart and enjoyable half marathon. Take it slow. Your body will thank you during the later miles. Run your own half marathon. Don't be worried if you see a lot of people passing you. Remember the tortoise and the hare? They may be starting out way too fast, so you'll catch them later—at your own pace. Going out too fast is one of the most common racing mistakes. time in the second half of your race. because you'll most likely try to keep up with them. corrections after just one mile. be passing a lot of those same runners later in the race. hold back during the first few miles, so you get used to the discipline of not going out too fast. Don't get too emotional. Try to stay as calm as possible for the first 5 miles. You want to conserve your mental energy for the rest of the half marathon. Break up the half marathon. Start breaking up the race into smaller segments. It will make the distance feel more manageable. At mile 10, for example, think, "It's just a 5K to go." Stay mentally tough. Your mental toughness will really start to be tested during these miles. Don't give into periods of self-doubt and discomfort. Remember all those miles you ran and the training you did, and have faith in it. Think about how hard you have worked and how rewarding it will be to complete your half marathon. Beat boredom. Do whatever it takes to keep your mind occupied: Sing songs, play mental games, count people, talk to other runners. how far it is to the finish line. as you keep getting closer and closer to him. motivation when you need it most. help you through a rough patch. and cheering. It helps me take my mind away from any discomfort I'm experiencing. Think outside the body. You may feel a little discomfort during these miles. You'll certainly feel tired. Let your mind take over from your body and try to focus on the outside—the spectators, the signs, the other runners, the scenery. Talk to yourself. At this point in the race, you need to dig down deep for extra strength. Use your running mantras. Remind yourself what you've sacrificed to get to this point. Remember how you've worked through fatigue during your training runs and how you can do it again. Set small milestones. Continue to break up the course, mile by mile. Start counting down the miles and the minutes. Made almost all mistakes during my first 10K, was much smarter during the second one... :). Now I hope, I will manage to follow this advice during my first halfmarathon also. Thanks for the article - it is good to have it in mind... :). Do you only run or do you do other sports too?